Le concept de prothèse d’épaule inversée inventée par le français le Pr Grammont, est utilisé en cas rupture de coiffe irréparable ou non fonctionnelle, ou encore en cas de fracture 4 parts et chez la personne agée. Le Centre Hospitalier Gabriel Martin de Saint-Paul, Ile de La Réunion (974) dispose de Prothèse d’épaule inversée sans tige et avec tige, cimentée ou non cimentée (press-fit métaphysaire). 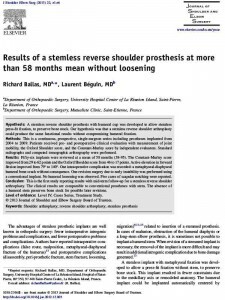 Results of a stemless reverse shoulder prosthesis, results at more than 58 months mean without loosening. 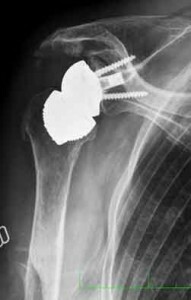 Hypothesis: A stemless reverse shoulder prosthesis with humeral cup was developed to allow a press-fit fixation without stem, and preservation of bone stock. Our hypothesis was that a Reverse Shoulder Arthroplasty without stem could produce the same functional results without compromising humeral fixation. Methods: This is a continuous, prospective, single-surgeon series including prostheses implanted from 2004 to 2009. Patients received pre-and postoperative clinical evaluation with measurement of joint mobility Oxford Shouder score and Constant-Murley score by independent evaluators. Standard radiographs and CT arthrography were performed. Results: Fifty-six implants were reviewed at a mean of 58.4 months (38-95). The Constant score improved from 29 to 62 points and the Oxford Shoulder score from 46 to 17 points. Anterior Active Elevation improved from 79° to 140°. One intraoperative complication was recorded: a metaphyseal-diaphyseal humeral bone crack without consequence. One revision surgery due to early instability was performed using a conventional implant. No humeral loosening was observed. Six cases of scapular notching were reported. Conclusions: This is the first study reporting results over a mean of 58 months regarding a Reverse Shoulder Arthroplasty without stem. The clinical results are comparable to conventional prostheses with stem, without any defect in the humeral attachment. The absence of humeral stem preserves the possibility of iterative and easy revision thanks to the preservation of bone stock. The advantages of implants without stem are known in orthopedic surgery: less intraoperative iatrogenic problems and complications, less postoperative problems and complications. Authors reported intraoperative complications (false route, malposition, metaphyseal-diaphyseal fracture of the humerus13), and postoperative complications (disassembly, peri-prosthetic fracture, stem fracture, loosening, migration)9,11,13. It was sometimes impossible to implant a humeral stem in cases of malunion, obstruction of humeral diaphysis or long stem prosthesis at the elbow. The volume of the stem and the cement was an additional risk factor for infection. When revision of an implant with intramedullary stem was necessary, the removal of the implant became more difficult and resulted in additional iatrogenic complication due to bone damage generated13. An implant with bone cut and metaphyseal fixation was developed to allow a press-fit fixation without stem, and preservation of bone stock. The position was free of constraints due to medullary axis or remodeled anatomy. The humeral implant could be implanted automatically centered by obviating the medial and posterior offset induced by the axis of the humeral shaft. A stemless prosthesis is an alternative to standard reverse stemmed prosthesis, with the advantage of less invasive surgery, no stem complication and easily revision possibility. Stemless Shoulder prostheses emerged during the 2000s. Anatomic implants without stems have proven to provide secure primary radiological fixations and good clinical outcomes6,7. The positioning of the anatomical prostheses with stem remains imperfect despite the modularity due to unique individual anatomy. The use of stemless anatomical prostheses is of interest due to independent positioning of the diaphyseal axis. Despite the good results obtained with the use of anatomical implants without stems, use of reversed stemless prostheses was limited for fear of failure of bone fixation, due to greater constraints. Our hypothesis was that a reverse shoulder arthroplasty without stem avoids complications related to the humeral stem, without affecting the fixation of the humeral component and functional results. The aim of our study was to evaluate the functional results and bone stability of the humeral component of a new Reverse Shoulder Arthroplasty without stem. The inclusion criteria were all stemless reverse shoulder prosthesis implant from 2004 to 2009. Exclusion criteria were prosthesis with stem. They were implanted in cases of prosthesis revision and proximal humeral fracture. This represented 15 patients during this study. We prospectively enrolled 56 patients who underwent reverse shoulder arthroplasty with humeral component without stem from 2004 to 2009 in order to have a minimum follow-up of 36 months. This is a continuous single surgeon series. The TESS prosthesis (Biomet Inc, Warsaw, IN) was the only reverse prosthesis in use during this period. The humeral stemless cup is made of cobalt chrome with a titanium plasma spay and hydroxyapatite coating, impacted into the humeral metaphysis. The polyethylene is clipped inside the cup and held by a metal ring. The surface of the corolla is composed of six anti-rotational branches. (Figure 1 and 2). The glenoid head is made of chrome cobalt and is bolted to a base metal glenoid fixed by four screws. The surgical procedure was performed under general anesthesia and patients received an inter-scalene block. The procedure was performed in “beach chair” position, the surgical approach was deltopectoral. The subscapularis muscle was incised vertically in the upper third of the tendon. After assessment of the lesions, tenotomy of the long head of biceps was performed and tenodesis was carried out in the gutter or not at the end of surgery. A cutting guide stem was introduced along the axis of the humeral shaft and metaphyseal bone cut was performed with the help of a guide of 150° tilt. A pin was centered on the bone section using a template and a humeral wicking was made to center the humeral digger. The pin was removed and a guard was placed on the cut surface during the glenoid preparation time. The glenoid was approached with a peri-glenoid capsular release and a centering with pin was made, and the glenoid was drilled. The glenoid metal-back baseplate was inserted and fixed by screws and the reverse head was impacted and screwed on its baseplate. The digger was then removed from the humerus. A specifically selected diameter hole was then drilled into the humerus in order to create a metaphyseal box wich could receive the final corolla impacted by press-fit. Trial humeral inserts were tested and the final polyethylene insert was impacted. After testing the amplitude and stability, the subscapularis muscle was reattached to the lesser tuberosity. Drainage was carried out for two days. In postoperative period, patients were immobilized by a brace in abduction at 30° for 45 days and rehabilitation care was immediate (Figure 3). Rehabilitation by a physiotherapist was started of passive and active mobilization above the plane of the orthosis. External rotation was limited to neutral postiton the first six weeks to protect the subscapularis muscle reinserted. General and administrative data was collected pre-operatively. Patients were seen in consultation for a clinical and radiological assessment at 45 days after surgery, 3 months, 6 months, one year and annually thereafter. All patients were clinically assessed by measuring range of motion using a goniometer, and evaluated using the Oxford shoulder score3. The Constant-Murley score2 was administrated by independent reviewers. Radiological examination included standard radiographs of double sided skew in the three rotations, and a profile of Lamy. A CT arthrography was performed before surgery and we counted the number of ruptured tendons of the rotator cuff and their fatty degeneration. The X-rays were studied by the two authors, both orthopaedic surgeons, in order to discern any migration of the implant, secondary displacement, the appearance of radiolucent lines, osteolysis or signs of loosening compared to previous films and post-operative ones. We observed the rocker and the recess in metaphyseal bone. Migration was studied by modifying the outcrop of the corolla over the cut surface of metaphyseal bone, internal or external for the rocker, both for recessing. We grouped the shoulders under the names of massive rotator cuff tears for Hamada and Fukuda stages I, II and III, cuff tear arthropathy for stage IV and V and primary omarthrosis for centered osteoarthritis with non-functional cuff5. During surgical exploration, an assessment of the lesions of the rotator cuff was performed by counting the number of ruptured tendons. The intraoperative complications (humeral fractures, glenoid fractures) and postoperative complications (hematoma, infection, neurological disorder) were identified. Statistical analysis was performed using SPSS software (SPSS version 17.0 software, SPSS Inc., Chicago, IL) for averages and percentages. The normality of distribution for quantitative values was assessed using the Skewness and Kurtosis coefficients and the Kolmogorov-Smirnov (Lilliefor) test. The parametric Student t test for paired samples was used to compare the preoperatives and postoperatives values. Statistical significance was set at p ≤ 0.05 for all tests. Fifty-six TESS reversed prostheses without stems were implanted in 56 patients (16 men and 40 women). The mean follow-up was 58.6 ± 14.2 months (38-95, median=57). The average age at the time of operation was 73.9 ± 6.8 years (55-85). Three patients (3 shoulders) were lost to follow-up. The dominant side was involved in 39 cases. The etiologies were as follows: 36% (20 shoulders) massive rotator cuff tears, 59% (33) cuff tear arthropathy and 5% (3) primary omarthrosis. The mean BMI was 26.3 ± 3.9 kg/m2 ((18-36) including 10 obese patients). The pre and postoperative data of patients, Oxford and Constant-Murley scores were represented in Table n°1. Preoperative radiographs were used to classify 46 shoulders (82%) as Hamada and Fukuda I, II or III scores and 10 shoulders (18%) in stage IV or V. The assessment of the cuff tear and fatty degeneration was reported in table n°2. One minor intraoperative complication occurred on the humeral side during the 16th procedure. It was an intraoperative partial humeral metaphyseal crack confirmed by postoperative X-ray. Primary stability was correct and there was no secondary displacement of the implant. Postoperative rehabilitation was the same than other patient. In the postoperative period, we identified a case of superficial infection wich was treated conservatively. One patient receiving anti-vitamin K required a surgical evacuation of a hematoma in the twenty-first day. One rupture of the subscapularis was found during a one year postoperative visit. A stress fracture of the acromion occurred 4 years after surgery and was treated conservatively. At the latest follow-up, there were no peri-prosthetic humeral radiolucencies, migration or loosening of the reverse humeral cup in the metaphysis. No modification of the outcrop of the corolla over the cut surface bone has appeared. A major lysis of the greater tuberosity was noted, without secondary displacement of the humeral corolla. Five stage 1 scapular notches appeared (9% of cases), one was observed 6 months after the procedure and four 12 months after the procedure. Revision surgery was necessary in four cases (7%). Disassembling of the components glenoidal occurred three times. Revision surgery was possible with a reverse prosthesis with primary stems in two cases (one case with iliac graft of the glenoid). A simple implant removal was performed in a third patient whose condition was unfavorable. One patient had an episode of instability three days after the procedure. The external reduction procedure caused a displacement of the humeral corolla (3rd postoperative day) requiring further surgery. This was done by a stemmed implant of the same manufacturer. This is the first study reporting specifically the results of a Reverse Shoulder Arthroplasty without stem. There was no loosening of the reverse cup at a mean of 58 months follow-up. Epidemiologic, etiological and radiographic data of the patients in our series was similar to those of patients in the literature5. The improvement in Constant score (33 points) and its components (pain: 8 points, activity: 9, mobility 12 points and strength 4 points) were comparable to the scores of French multicenter study in 20061 (Constant: +38 points). The mean preoperative elevation of 79° improved to 140° postoperatively (increase of 61°) which corresponds to literature data1,12 (59° for the French multicenter study symposium series). The results of stemless Anatomic Total Shoulder Arthroplasty were recently evaluated and showed functional results comparable to the prosthesis with stem, with excellent bone fixation6,7 without the appearance of radiolucent lines or loosening. The use of constraint shoulder arthroplasty without stem required an evaluation of the humeral stability since the joint constraint leads to increased solicitation at bone interfaces. Our study showed that at almost mean 5-year follow up bone stability was not compromised. Only one traumatic case occurred. It was trauma resulting from external reduction maneuvers further to early dislocation (3rd postoperative day). Radiographic analysis did not show up periprosthetic radiolucent lines or signs of loosening at the last follow-up. There was no radiographic mobilisation of the implants. The advantages of implants without stem are known in orthopedic surgery; less intra-operative iatrogenic complications, less post-operative complications. 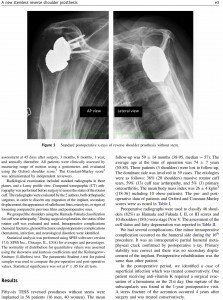 Few large series reported complications of reversed shoulder prosthesis4,13. Complications related to the humeral stem accounted for 101 to 20%13 of postoperatives complications. It concerned periprosthetice fracture, disassembly, lossening. The prevalence was 4.2%, wich represented 20% of post-opérative complications for Zumstein13. Analysis by Baulot during the French multicenter study symposium, showed that 10% of reversed shoulder prostheses complications were related to humerus that is a prevalence of 2.1% for humeral complications and 1.5% for periprosthetic fractures1. Zumstein showed the difficulty to collect that kind of information. The revisions rates are variable due to unclear definitions of complications and revisions13. The implantation of an intramedullary stem remains, however, not without risk. When revision was nedded, ablation of stem prosthesis was difficult. Zumstein reported 16 intraoperatives humeral fractures over 24 intraoperatives complications (67%). They occurred mainly during removal of the primary humeral stem or cement mantle in revision surgery in up to 24.1% of all revisions13. Another advantage of that kind of stemless prosthesis was preservation of bone stock, so revision surgery can be undertaken easily. We also noted on a subjective level, a lower frequency of complaints of arm pain after our experience with reverse prosthesis stem. The explanation is probably the absence of stress shielding caused by a conflict with an intramedullary humeral stem. The positioning of the humeral corolla in inclination and version was free with independence vis-à-vis the humeral shaft. The rate of scapular notching was 9%, all of stage I. These notches appeared one year after surgery and were non-progressive at last follow-up. We did not find a more advanced stage of notches. Kadum8 did not report notches in his series of 21 TESS reversed prostheses at a mean of 14 months. The percentage of scapular notches seemed lower than in other series using other implants. The prevalence of notches in the literature varied widely and could exceed 50%4. The French multicenter study reported a notch in 68% of cases at a mean 51 months1. The notches seemed to appear early, with 48% occurring at 1 year follow-up and 60% at 2 year follow-up. Their progression and significance were difficult to interpret. Revision surgeries in our study were related to glenoid disassembly in three cases and one case of an early traumatic displacement of the humeral corolla, caused by external manipulation of reduction of an post-operative dislocation. Surgical revision was performed using a primary implant with stem. The surgical procedure took place without any particular difficulty with the preservation of bone stock from its initial cut. The original implant could be extracted without degradation of the remaining bone stock and the humeral component was implanted in the same condition as primary implantation of reverse shoulder prosthesis with stem. The rate of glenoid complications (5%) was comparable to those reported in the literature (5.1% in the series of French multicenter study10 with 4.1% loosening and 5.75% reported by Farshad4). The design of the glenoid socket and its attachment were improved after this series of implants. The initial glenoid component had an impaction system between baseplate and reverse head not easy. This led to incomplete attachment and further disassembly. This was the reason why three revisions were necessary to change the glenoid component. The design improvement concern the morse taper. The bone fixation of the baseplate was modified to allow better bone anchorage with screws and pins. Indications for surgery were the same as for stemmed implants. The contraindications concerned cases of advanced osteopenia with metaphyseal cancellous bone or uncertain quality. In the early stages of our study, we preferred to use an implant stem for some cases for whom we had reservations (15 during the period of this series). After this series, no more stemmed reverse prosthesis was implanted. It was a limitation of the study. In our experience, the humeral drill had more of a role of compactor of the cancellous bone than a drill strictly speaking, to preserve cancellous bone between the implant and metaphyseal cortical bone. The case of partial metaphyseal bone crack appeared among our first implantations, caused by searching for a contact between the cortical metaphyseal and humeral corolla, and due to the use of over-sized implant. It was better to use press-fit implants in cancellous bone, and not to seek a cortical contact. These pitfalls during the initial procedures had been experienced with anatomical stemless prostheses implantation6,7, without putting stability of the implant into question. The authors also recommended preserving a metaphyseal bone stock7. This was the first specific study reporting the results of a reverse prosthesis without stem. The primary and secondary bone fixation was excellent. Clinical and radiological outcomes at almost 5 year follow-up were comparable to reverse shoulder prosthesis with stem reported in the literature. Complications related to the stem described in the literature in terms of intraoperative or postoperative iatrogenic complications did not occur. Not using a humeral stem preserved the possibility of easy and iterative revision surgery. Our study showed the possibility of implanting a humeral cup without stem for a reverse shoulder arthroplasty in safety conditions. It now appears legitimate to suggest a humeral implant without stem for a primary procedure with reverse shoulder prosthesis. Studies are needed to assess the longer-term outcome of this new type of implant. Conboy VB, Morris RW, Kiss J, Carr AJ. An evaluation of the Constant-Murley shoulder assessment. J Bone Joint Surg Br. 1996 Mar;78(2):229–232. Dawson J, Fitzpatrick R, Carr A. Questionnaire on the perceptions of patients about shoulder surgery. J Bone Joint Surg Br. 1996 Jul;78(4):593–600. Wirth MA, Rockwood CA Jr. Complications of total shoulder-replacement arthroplasty. J Bone Joint Surg Am. 1996 Apr;78(4):603–616. Table n°2: Pre and postoperative assessment of the rotator cuff.